Housing market outlook: Last 5 years- Inventories have come down, prices have fallen. Most purchases are from end users and not investors. There will be demand for housing as long as India’s growth continues. Seeing good recoveries. In H1 FY19, ARC has recovered 2000cr, in H2, recoveries can be 10,000-12,000cr. We have also invested in RE projects through ARC and capable of doing more. May create focused RE fund for distressed RE assets. On asked about profits from specific transaction of Essar : Management has policy of not disclosing such info. Total revenue grew by 32 % to 2672 Cr compare to last year same quarter. PAT grew by 47 % to 272 Cr compare 185 Cr to same quarter last year. EX-Insurance PAT grew by 46 % to 372 Cr from 207 Cr last year same quarter. ARC business has done well, Wealth Management business also grew to 1 lakh Cr of asset and Asset management grew to total 35,000 Cr . 9-10 % of total balance sheet and 10-11 % of total borrowing stood as liquidity portion. Company will be working on Diversified model. Capital adequacy ratio stood at 16.6 % for the quarter. Company aim to maintain liquidity at 11-13 % of total borrowing. Company had raise 2000 Cr by public issue Bond in NBFC EFL Ltd.
Asset to Equity ratio remain at 5.2 times as on 30th Sep 2018. Company continue to get funding from money market and Banks. Company had raise 2500 Cr and 2450 Cr as on 31st Aug-2018 in form of commercial paper. Company have 7600 Cr of which 550 Cr is in form of commercial paper. PAT grew by 54 % to 245 Cr compare to same quarter last year. Share of retail credit grow to 42 %compare to 41 % in Q1 FY19. This segment impact due to capital market activity during the quarter. GNPA stood at 1.78 % and NNPA stood at 0.78 % for the quarter. Life Insurance Business grew by 63 % to 184 Cr for the quarter. In last 8-10 days things are starting to open up and seeing volume in commercial paper. 30 % of normal value are back. Bank line are still there but on Bond market side it is 30 % of normal volumes and by end of November there will be 60-70 % of normal volumes.The fear is now getting low. In next few weeks liquidity will be normal. Company have obligation of around 12,000 Cr to repay till march. 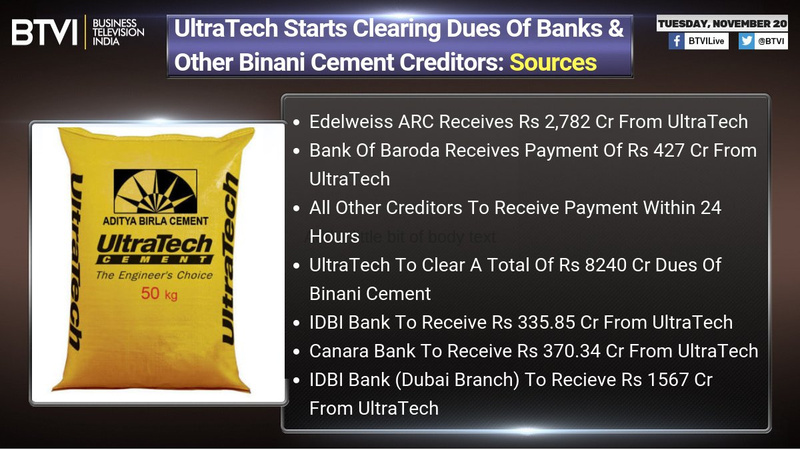 Around 3000 Cr will come to ARC business in next 6 month and get 400-500 Cr flow monthly from company credit business which will be another 2000-3000 Cr and company have Bank line of 6000 Cr. Inflow from mutual fund market will open up soon and commercial paper and NCD will also start soon. Company will manage the liquidity. Company wait for opening of NCD and bond market and liquiditycoming to normal so that was there… For next 5-6 month all company will be careful in managing the liquidity. Thing like ECB and international market will also on the source of liquidityfor HFC. Company have never use Commercial Paper as ALM Arbitrage tool so in profitability there is no excess profit which come with commercial paper utilization. Commercial Paper borrowing was directing for treasury and liquid credit Book. If commercial paper market shrink and remain half of normal than around 4000-5000 Cr of borrowing opportunity will go in commercial paper.Which was funding company treasury and liquidity credit book.These books have average ROA of 100 basis point . From profitability point of view shrinking of Commercial Paper by 4000-5000 Cr will impact 40-50 Cr in profitability for company which can be handled in a diversified way. Company will use loan against security with which the cost may go up but company will pass it on to the customer and continue to provide this product. Of total 40,000 Cr of loan book 12-13000 Cr is retail asset book and 14000 Cr is real estate book and wholesale mortgage and 9000 Cris the corporate book , 8000 Cr is share and agribook which is keyin nature as liquid book and 7000 Cr of ARC and distressed book. Company was having access credit of 140 Cr when company had converted to IND-AS . Most of credit book if collateral with almost LTP of between 44-55 % and in all deposit loan and there was also high rate of recovery. It should continue to do well. There is no asset bubble because price had not gone up in last 5 years.In first half there was 8 % growth in home sales over last year. India economy grew at 7-8 % without having interest risk . India is selling 12 million house a year and there will be demand .If any project get stuck it will be because of lack of fund. Completed projects is not very hard to sell . Home sales will not slow down so the real estate portfolio should continue to do well. Robust and deployed further fund in the quarter and company has seen good recovery during the quarter of almost 2000 Cr and expect to recover 12-13000 Cr n the next half on the large recovery of Essar and Binanai will start coming. So company will receive funds back. Company have lot of opportunity to deploy the funds over next 3 quarters;.So once fund come company will deploy back because current pipeline look very good. Company is doing well diversified business and NBFC is not the only business. Liquidity will be normal. NBFC has been responsible for Credit delay in India. NBFC and bank coming high in a robust model for credit book of the country. Their might be some headwind because of liquidity crunch and this will handle by diversified model .In credit business company continue to balance book by growing retail faster than wholesale that has been strategy of company. Company will do wholesale from the fund it manage. Continue to deploy fund on corporate fund as well as real estate credit through the fund that company manage. In whole sale credit company had raise more than 1 Bn dollar over last few years and quite of it is un-deployed capital is available so company will grow in wholesale and retail too. Kindly provide the detail of loan toward wholesale which are collateralized ? What will be the effective tax rate going forward ? On the wholesale book company have fix CAPon per account which is 1 % of the total credit book. Company current account CAP is 400 Cr for accounts. Company have 60-65 accounts on the real estate book and another about 40-45 on the corporate book. Top ten clients could end up of 35 % of total book. It is same from the last 10 years where there is a tail and there are few accounts . Company look on more account CAP and it should never be more than of total credit book which is currently about 49,000 Cr. On the tax rate the insurance rate which company have higher tax rate on the consolidated Tax account. If interest rate become positive than does tax rate will come down ? It will actually been better because insurance business is carry forwarding the loss so hopefully it won’t pay tax . Currently company have loss on that and not getting the offset. What are the number of account in the wholesale book and how they are specifc in geographically in Mumbai, NCR , Bangalore ? What is the risk management system in Loan and what kind of promoter funding is there in loan against securities? Company is largely present in six large markets Mumbai including MMRand Pune are 1/3rd of the book then NCR would be 25-30 % andbalance would be distributed in Bangalore , Chennai and Hyderabad.The total number of projects can be 60-65 at any point of time. On Loan against shares the large part of it is ESOPS funding because company is of the leader in ESOP funding almost 75 % of the book is ESOP financing which are to individual and High level in Banks when they exercise the ESOPS the balance 25 % is also margin funding book. There is no promoter funding and promoter financing it is mainly for wealth management customers and LTC in that is about 50 %. In this there has been no fall in deliquesces and NPA in this book. How much borrowing was done from the banking channel post September? Company got approvals of about 2500 in which 1500 Cr is from the Commercial paper and 1000 Cr from the Banking line. What has been the borrowing cost from both bank and commercial papers ? Its about 40-45 bps more from the normal one. Now 40 % of the book is large wholesale to corporate side so with increase of cost of fund does company is able to pass it on to new customers or company will slow down the lending ? Company can pass on the cost and company has done that where company NIMS has been steady to given on the SME book and small ticket home loan if the cost has gone up than company has been able to pass it. It get pass on in form of reducing the processing fees wave off and adjust the actual yield on NIMS.So there are parts of book where company can pass on the cost and company Liability is also 1/3rd of the book and it is getting reprised. Company borrowing is also more than 3 years at a fix rate. 65 % of company borrowing is above 18 months so there is no reprising. Assets get reprised when liability get reprised. Company NIMS got impacted by 20-30 basis points so from last many years company NIMS have been around 7 and 7.5 % and they borne above 20-30 basis points or below that depending on the interest rate sensitivity. Company will maintain NIMS at 7.5 % half percent here or there and that is achievable in spite of increase in cost of borrowing. Company is not looking to slow don the lending because of interest rate but liquidity is always a reason. For next 5-6 month company will continue with retail and SME. On wholesale one there will be slowdown until the liquidity conditions come back to normal. For next 5-6 month everybody will be looking on liquidity and carry forward with the liquidity available in the market. How company is going on with underwriting as there is concern on the whole real estate segment ? There are two parts of it one is underwriting and other is post underwriting. Company is focus on housing because housing is a self liquidating asset unlike an insurance project where there is no exit available. 95 % of company loan is in housing and all are RERA approved. In94 % of the project company is the sole lender because at the FPV level company risk management is much easier if one control the project. Apartments or houses which are below 1 Cr demand is very strong about 50-75 lakhs in all India basis and around 1-1.5 Cr in Mumbai. So this is the range at which demand is very robust so 80 % of inventory is below 1 Cr category. Company has developed a robust post disbursement also. Company do project management for the people who work in real estate for years so company do very active monitoring and company also have sales and distribution team which also can sell apartment and homes and on an average company sold 20-30 apartments in a month to 30-40 apartment on an ongoing basis.Company have sales capability , project capability as well in ARC company also have distressed asset management capability when project get completed because in real estate completion of project is most critical part . If one complete the project everything get handled. Company have sold about 100 thousand sqft per month in the last few months on own inventory. The distribution channel had sold 1 lakh sq foot every month. What amount company will receive from Essar ? How comfortable is company on its retail book and in this back drop will company reduce the wholesale book ? On the entire contagion on the sector , SO how company see the risk in the sector ? The loss given in the while are 7.5 % on stage-3 . One have NPA but very high recoveries in this books also. At a project level there is not much requirement of incremental funding. If incremental funding will not happen than new projects will not get launch In next financial year . If project will get completed than most of the risk get mitigated because it don’t erode the collateral cover too much. So the Key is the Home loan will continue if the project get completed. Therefore FPV level management is very important. In Infra also If a road project get completed than there is no risk in that also and in road there is no liquidity event but in home they are self liquidating assetsso as long as that continue there is no worry.At a project level there will some project with funding gap and that will also struggle to get additional funding but there will be other stress funds even company is also looking at some fund to provide last mile funding for good projects. Other ARC has also done that with Malls , Hotels and other commercials in past. With the regulations changing on mutual fund TER so how company see both asset management and Mutual fund business going forward ? Will TER will also affect the PMS business also ? There is a lot more focus on alternatives and this will shift some of the strategies into alternative funds and it is not with credit funds because they don’t have ALM and they don’t have NPA issues because they are not borrowing so given that as NPA issue and borrowing issue is not there the risk-reward is good and recoveries are there into NPA. This is bring more focus on private credit fund or more alternative. So on both asset management and wealth management there is huge focus on alternatives. So recent mutual fund changes will not affect much and it will give boost to the alternatives credit funds because different strategies will come out from different organizations such as NBFC , HFC , Private Funds. In company asset and wealth management business company build a strong franchisee as customer satisfaction rates are very high and lot of company customer are not looking for innovative products which happen to alternatives. Mutual fund always be there and alternatives will be there… Alternatives fees will not come down. What is the overall view on Mutual fund TER going down ? The volumes will go up . Fees and commission will come down. One will use a more technology scaling benefits to compensate and hard profiting. Profit will go up and that will be for next ten years because India is stilling scaling up. In the brokerage industry also the commission coming down but the scale is going up because of use of technology and scale going forward. Due to liquidity issue will there be some large defaults that might happen ? Most of the real estate project financing is at SPV level. Most of the finance can control the project and company change even the developer on a particular project if they cannot complete it. Even is any project get stuck thanbig developer come in with touch to company in a DP model. There is lot of mis-understanding that developers will default remember funding is at project level and it is very insulated. If a developer default on one project then he will not be able to continue on other projects atleast if the financial closure on a particular project are going well. Earlier developer was moving money from one project to another project as they see financial crises on any project but from new law now developer cannot move money from one project to another project. 70 % of the cash flow of project has to remain under project under law and it is criminal offence now to take money out of project.Earlier finance company have to do project monitoring at a intense level to make sure the finance is going at right place and now the law has been place so no body will try that. In real estate now every project is independent and every project is insulated.In 95 % of projects company is sole creditors so company can change the developer, fund last mile funding, cut prices and forsee to sell more inventory all of that can be done if one have control on the SPV at project level. Does the consolidation in the real estate will be more slightly for next 3-5 years ? It is going on from last few years and in most of the industry there is no oligopoly market. India is a large market and every city is different. Consolidation will be there but the weaker developer who have a good project will partner with the stronger one and there are so many such cases in the last 3-4 years where strong developers don’t bring their capital and now the biggest constraint in the Oligopoly market is how much capital should put to work. Company has also funded 10-12 such cases. When will company plan to raise capital ? In Fiscal 2020 H1 company will raise capital because there will be growth strategies and that require capital. If company change the developer than what happen to the prices of that real estate project will It become contingent ?In recovery 84 % is cash and rest is other assets so kindly share company experience in other assets of recovery in the prices of asset revolution so was there any haircut on the recovery part of asset ? In last 5 years prices has not gone up but actual come down as a result of that there will no cutting of pricing but there will be structuring that will happen . People will take more cash upfront and they will be willing to reduce price for that. The outcome will be the more cash one is willing to pay upfront the more lower price one will get. Because in last 5 year prices have not gone anywhere. Actual demand is there so people will try to incentivize to do cash payment. Other asset is personal guarantee and other assets that are pledge with company is also have power to liquidate that . At a project level company will be able to recover 84 % money after that company will use other ways of recovering. Did company do end to end financing from starting to end ? No company come after the land approval been done when developer put some equity and he have some equity partners of equity funds coming there and after that company do project funding where there is construction financing then there is actual sales that happens so either company do construction financing or get help from banks to do construction finance which is usually a small part but at a project stage that is only finance here. Liquidity cushion on balance sheet is 3300 Cr and cash in liquid asset are 6900 Cr so is there an additional cash of 3600 Cr ? Yes. Company do differentiate between liquidity cushion and treasury assets Treasury assets can be in form ofG-SECor Cash future arbitrage usually the treasury assets or part of the charge that company give to the bank. The liquidity cushion is free of charge while treasury assets have a floating charge. The treasury assets is also liquid assets. What is the nature of this liquidity cushion of the 3300 Cr ? Mutual funds , Government Sec, FD in Banks. How will be the NPA trend going forward ? It will remain in a control upto 2 % Net NPA. What is the buyers side borrowing mix when they finance from Banks or HFC on retail side ? Company has taken 56 % Provisioningon the NPA. This is slightly higher than the loss given default because this is actually expects. This will maintain company recovery rate .On the home loans almost 80-90 % of these are with home loans and there will be very rare apartment which got sold without home loans and it is about 55 % from Banks and 45 % from Non-Banks which include HDFC and others also. If there is a slow down in home loans by HFC than also it will not materially impact the overall profile. Infact every project in which company had funded there are usually 3-4 home loan companies have a stall there and most often is PNB Housing , HDFC , SBI etc. How will company see its borrowing strategy going forward to ensure that company have diversified source of funding ?Does company wealth management and asset management is also link to capital market or the correlation is on the lower side ?How should one look at the aspiration of growing by 25-30 % ? Mutual funds are almost 32 % of borrowing in that half is from CP andhalf is from NCD. So NCD is more important CP is a smaller part of the problem because the total outstanding CP is even shrink by half would not change much for the industry as a whole. If one is leveraging from CP then its profit got impacted. Retail is 17 % of company borrowing and company long term target on retail is 25 % . Borrowing should be about 30 % banks , 30 % retail , 15 % NCD , 5-8 % Commercial Paper and other would be Insurance companies and international borrowing . So part of mutual fund will get replaced from retail on a longer term basis which might be slightly higher cost but more longer term and stable. Company have always kept band between 35-40 years and that will continue to be there. Borrowing from bank is also another source of stability in this time also. The mix will continue. On the cyclist of asset management so the asset management is alternative and credit . The equity market cyclist doesn’t affect it that muchand lot of credit will start move from NBFC and also Mutual funds to the private credit funds. Last part of this problem happen because mutual fund exposure to IL&FS because as an industry mutual funds are comfortable to take interest rate risk but are not comfortable taking credit risk. So whenever there is a credit risk investors in mutual fund get spooked .So ultimately the credit part of that risk goes to other credit fund and that has been the hypothesis for many years and it will get accelerated with development in recent market. In terms of liquidityit is going slightly lower on growth and in coming couple of quarters the growth will take a back but on longer term basis nothing will change much and definitely everybody will have good growth in the first half so little bit of scaling back of growth in the second half just adapt and adjust to the liquidity environment and it will be more prudent also. In Q3 and Q4 some growth is inevitable because everybody is going to hold cash to be on the safe side. There will be no structural changes in wealth management and asset management business. So on the longer term side the 25-30 % growth will not change slow down will be just for some quarters. What is the outlook on the second half and which factor will be positive and negative for the industry as well as for the company ? Next six month depend on how things come normal and companies will hold cash and holding cash is an expensive thing .Company is currently holding about 7000-8000 Cr equivalent of cash and cash equivalent activity. So next 5-6 month the growth will be slow. In next couple of years company have some tailwind on the ARC business as recovery will happen and some incentive will also come.Same will happen in Real estate . So company diversified model allow to change every challenge into opportunity. So ARC and asset management will clearly see some benefit and opportunity out of it. There was a good insight by the promoter of MAS Financial on the current state of crisis looming on NBFCs in the market. Thought to share it here too ! "In the events of Crisis , everyone becomes Irrational and start painting everyone with same Brush. Approach towards individual Companies should be discreet. In good times , not every company is good and in bad times , not every company is bad. MAS has experienced 1995 Crisis , 2002 Earthquakes , 2008 financial crisis and 2013 liquidity crisis. Companies with sound Fundamentals will navigate through these times and will grow and create good assets. For India to grow at 7% of GDP , NBFCs are the backbone. NBFCs remains the most important last mile delivery of credit . There is no slowdown from the end user demand and these are temporary times which will pass soon. I just did back-of-the-envelope check to see what market is implying within current price of Edelweiss. Current Book Value = 7500cr as per latest Sep '18 balance-sheet. I take ~15% haircut to it and I get 6400cr as current book value. Earnings Power = 900/0.10 = 9000cr (explanation to earnings power calculation - assume that 900cr of FY18 earnings will continue as annuity yield with no growth in future. 10% as after-tax discount rate which means 11.75% before-tax discount rate which comes close to Edelweiss’ today’s corporate bond yield. If I had used pre-tax earnings in numerator, I would have taken 11.75% as discount rate). So I get Edelweiss Value = 6400cr + 9000cr = 15400cr which is close to current market cap of 15625cr. IMHO one is not paying for any growth at current market price and eventually getting a well diversified financial services business in an economy which has potential to grow approx 5x in next 20 years (GDP of $2.5T to $12.5T). IMHO market has literally taken Mr. Rashesh Shah’s statement of future slower growth as “forever no growth” . And just 2 months back market was implying forever 20% kind of earnings growth. This proves market’s exuberance on both the sides! Disc: accumulating at current levels and hence views will be biased. P.S. : I know a lot of folks will rip apart above back-of-the-envelope calculation. I am not here to argue on current book quality, or hair-cut %, or other appropriate discount rate. Just wanted to share my findings of what market is implying at current levels using conservative assumptions. If you have a better way to do back-of-the-envelope valuation of Edelweiss, would love to see it and learn from it. Not sure about this, but is there an element of double counting in your calculations? Doesn’t your Earnings Power include earnings from the current Book Value? You can’t include both current Book Value and future Earnings Power, which is partly based on the same Book Value, can you? As a test, assume all the debtors prepay Edelweiss with a 15% haircut (15% figure taken from your post), which the company distributes to the shareholders. Now how much will the company earn from new business in the long term? That, discounted to present value, can be the Earnings Power. I may be wrong here, happy to be corrected. Hi - you have double counted the income on nbfc business and hair cut on book value. Sharing my rough cut valuation for comparison sake. Multiples considered are purely arbitrary based on my limited experience. Lending: I expect near term RoE to be in 15-17% range (it is ~18% for last 2 years) largely due to reduction in high yielding RE and Structured lending, increased cost of borrowing partly offset by improved realisations from ARC business. Long term Growth in BVPS would be in line with RoE. Hence, i feel 2.5 times is a fair P/B multiple. However depending on the risk perception on the lending book, this can be lower. 2.Life Insurance: I dont understand valuation of Life Insurance business very well, but if edelweiss were to sell their entire stake today to another party, i feel they should fetch atleast the amount of EV. Once the business matures, they would get advantages of ecomonies of scale and underwriting and going forward if management doesnt make big mistakes, it can be valued at 2-3 times EV like peers. Capital markets advisory - Taking low multiples since FY18 would be at a higher end of profits in a cyclical business. Wealth management - Many headwinds, multiple in line with peers. Asset management - Have taken normalized PAT on AUM since their AMC is still loss making. 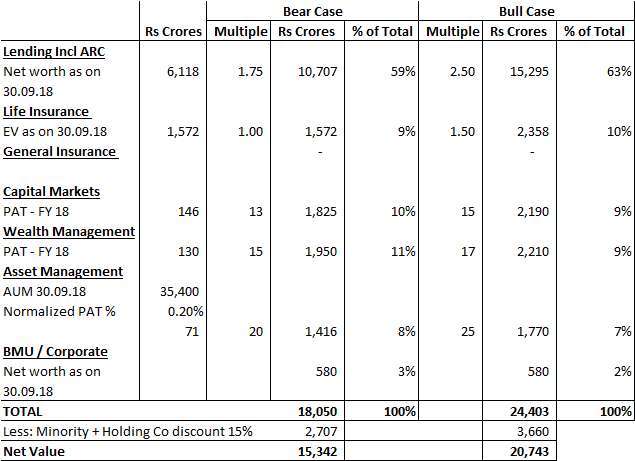 HDFC AMC earns 0.3-0.4% of AUM as PAT but that can change now with the SEBI cap. Edelweiss actually has a high share of higher yielding alternatives but unless the size of AUM goes up, cost efficiencies would not be there. That is why I have taken 0.20%. Barring wealth management, I feel in each of their businesses, the sector can grow at 15% + in the long term. My bet is mainly on the Management to not make any blunders in the future and atleast grow in line with the peer set. I am hardly an expert on valuation and more of a ‘feel’ guy when it comes to assessing businesses. Hence pls pardon any mistakes in the above. 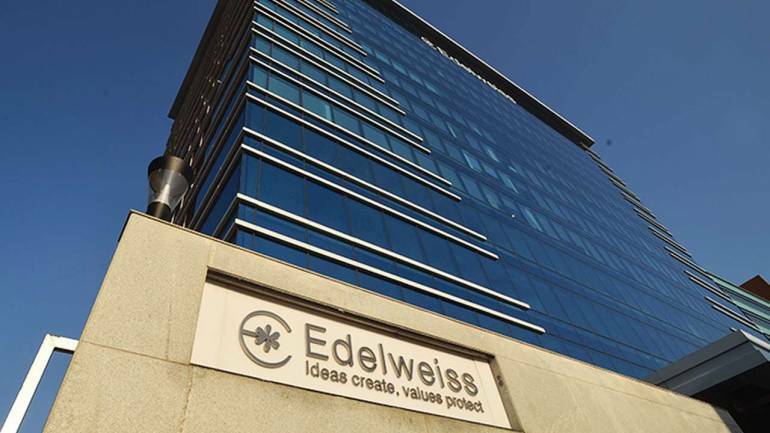 Not doing much calculations but I have been visiting edelweiss regularly as we are one of their supplier and I manage the customer ( edelweiss ) relationship from my organization. To all whom I have been meeting and interacting are middle management staff there and all of them are very positive and bullish about their future potential and growth. There is absolutely no negativity about anything happening to their share prices in market and all of them suggested me to accumulate/buy if I have holding period of midium term ( 3-4 years ). Just sharing it in case . Disc - I am invested in it and have bought it at 300, 220 , 170 , 135 levels and it forms 14 percent of my PF at yesterday’s closing price. So my views can be biased. Edelweiss’ stock is suffering from sector headwinds only. Series of interview by Rashesh Shah was taken wrongly by the market. In the last one to BloombergQuint he specifically mentioned that his view on the NBFC sector is different from what is happening in his own company. Folks forget that he is also FICCI chairman so he has responsibility to speak from the macro point of view. Coming to the Edelweiss, it was clearly mentioned in the Q2 concall that they have 3-4k cr worth of bank lines available and daily CP data suggest that Edel is raising short term money at competitive rates. They have repetitively mentioned that they have good relations with more than 40+ banks as they keep buying NPAs from them. As far as I know they have access to the top decision makers in these banks for quite a few reasons. One is NPA and the other is Edel is the largest debt market arranger for many entities including banks. I never believed that they would face any liquidity issue but on their part they have been extra cautious in investor communications. One more thing we need to keep in mind that they will have the largest ARC recovery so far in the coming 2 quarters. So all slowdown talk in Wealth Mgmt, AMC and Capital market will be compensated by ARC profits. Rashesh Shah mentioned that they will have 2.5-3k cr of cash inflows from Binani and Essar case resolutions but refrained from giving any profit guidance. I think FY19 is sorted for Edel and we need to start thinking about FY20. Hopefully capital market would revive by then or after election during Q1 FY20. Binani deal is finally closed. Old estimate suggest they would make 500cr profits from this one deal. Good to receive 2800cr cash in these tough times. Hi - Rs.2,800 Cr. of receipt does not mean Rs.2,800 Cr. of profit. ARCs basically buy debt from banks at a discount/hair cut - usually 25% to 50%. While buying this debt they pay upfront cash of 15% and issue Security Receipts for balance amount. When ARCs recover money they are supposed to redeem the Security Receipts. ARCs profit if the discount/haircut at which they had bought the Debt is more than the eventual haircut the lenders have to take in the resolution deal. So out of the Rs.2,800 Cr. of money that is coming back they have to still repay the lenders from which they had bought the Binami Debt and the profit would be the difference in the haircut and eventual discount. In your second paragraph, I think you want to say that discount rec’d by ARC company is higher than the haircut settled with lender. I think what matters is that folks are buying in deliveries or not and on that front no worries. I feel that the stock is being accumulated after a big fall and should consolidate given the amount of free float. If it keeps earning growth intact even during the downturn, will deserve a big upgrade and rerating in the market upturn. any meaningful value to Edelweiss’s other businesses!